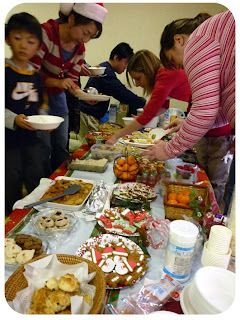 Yesterday was our bilingual kids playgroup party, we had 10 families attend, sadly a couple of families called in sick and had to miss the fun. 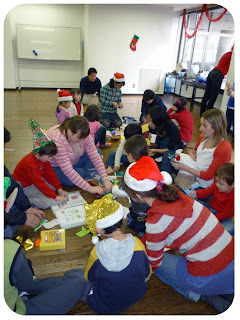 We did some colouring, origami, played games and had a visit from Santa. We don't have a group leader as such, everyone chips in, so everyone bought a game or activity to do, although we ran out of time! 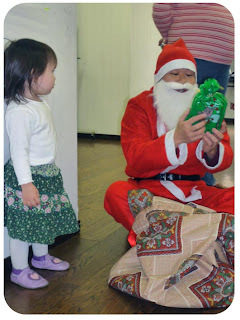 We make the dads do janken (rock, paper, scissors) and the winner gets to be Santa, this year Hiroki won the job, he was really funny and this is actually his youngest daughter, who wasn't convinced about it all at all. For the presents each parent brings a gift, wrapped and labelled for their child, we have found this system works the best. I also finished the secret project (hobby horse) at the weekend, he is SO cool. I haven't taken pictures yet because I don't want a certain someone spotting them, I am more than happy with the result!